Bohra Ganesh Ji Temple is one of famous Ganesh Temple in Udaipur city of southern Rajasthan. 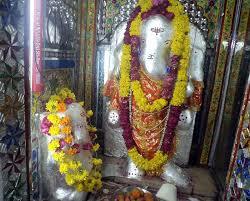 Bohra Ganesh Ji Temple is situated near Mohanlal Sukhadia University gate or Thokar railway station. This is old and famous Ganesh Temple with standing statue of Shree Ganesh Ji considered very fruitful (Chamatkarik).Thousands of Bhaktas(devotees) come here every Wednesday. It is belief that every holy event like marriage or other work like new business or any new purchase started with the worship of lord Ganesha will be done happily with the blessings of Lord Ganesha. Bohra Ganesh Temple is believed to be about 350 years old. Originally named as 'Borganesh', the temple was built outside the then city boundary of Udaipur. But since then, due to expansion of city boundaries, this area now falls within under the city limits. Now the entire area is also known as Bohra Ganesh. This new name of this temple also has an interesting story behind. It is believed that 70â€“80 years ago people who needed money for purposes like marriage and business would write the requirement on a slip of paper and leave it before the idol. Soon he would get the amount needed, but in turn they had to return the amount with interest. In India, it is generally the Bohra cast which is involved in business of lending money. For this reason, Lord Ganesh here got named as Bohra Ganesh. However, it is also a common belief that devotees with real trust on Bohra Ganesh also get their wishes fulfilled. The Bohra Ganesh Temple, located on the Bohra Ganesh Road, is around 2 km from city center, and 4 km from Udaipur City railway station.